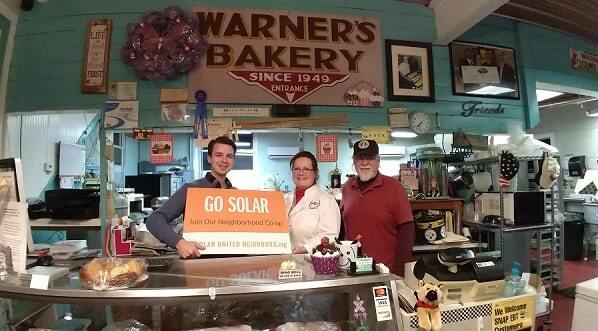 Warner’s Bakery in Titusville hosted the selection committee meeting and are also hoping to go solar at their historic bakery through the co-op. The Crawford-Mercer Solar Co-op has selected EIS Solar to install solar panels for the 22-member group. Co-op members selected EIS Solar through a competitive bidding process over 2 other firms. Co-op members selected EIS Solar because of their competitive pricing, selection of quality products, their deep record of installs, and the care to detail they put into their bid responses. The co-op is open to new members until Friday, March 29. Residents of both Crawford and Mercer Counties interested in joining the co-op can sign up at the co-op website: www.solarunitedneighbors.org/crawford-mercer. Joining the co-op is not a commitment to purchase panels. EIS Solar will provide each co-op member with an individualized proposal based on the group rate. By going solar as a group and choosing a single installer, participants can save off the cost of going solar and have the support of fellow group members and solar experts at Solar United Neighbors.